A little work in progress. I have been basing these guys on and off for a week so far. 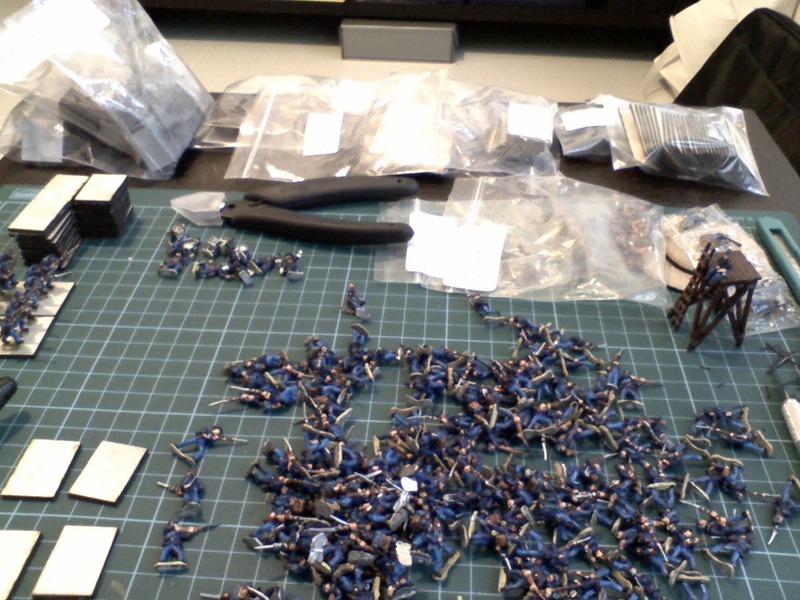 I reckon I have about 60 bases to go, then a few previously based ones to fix. I was originally basing on 30x30mm bases for infantry and 30mm wide for cavalry, artillery etc but decided to go with Fire and Fury original base sizes. Next I can start flocking. The flocking will give me something else to do whilst I am waiting for the last batch of figures from Miniature Lanka. There are times, like when I am trying to rebase figures, when I wish basing was still paint the base in mid-green rather than the nice sand and static grass look. When the bases have had the PVA glue and sand treatment it is a real Be-atch to get the figures off those bases. Target is to finish these bases tonight! With rebasing, and the PVA being water soluble, get a tray, but the figures in and add water to the ankles. Leave for 24 hours and they just lift off. Messy but. It is one of the reasons I always base using PVA. The other reason is that if you use a lot of PVA it also starts to provide a ‘slope’ to hide the actual bases. PVA has a chemical in it that starts the lead rot reaction. Whilst I know that most figures sold these days are lead free, it is a hang-up from the past. Figure is varnished protecting lead except under the base. the Tarzans grip therefore protected that too. Having said that, I am now inclined to try basing with PVA on the next batch as I can paint the PVA on the figures base, then on the base to adhere and dump some sand on that area at that time – may be especially useful for basing 6mm figures.